How can solar energy be ideally integrated into an urban energy system? This has been the key question of IEA Task 52: Solar Heat and Energy Economics in Urban Environments. One and a half years after the task´s start in January 2014, scientists from Germany, Denmark, Austria and Switzerland met in Freiburg for the third task meeting in mid-April to discuss cost assessments of existing plants and models for analysing complex urban energy systems. One of the first published outcomes is a study carried out by Austrian research institute AEE INTEC. It lists the costs of existing solar district heating plants in Denmark, Germany and Austria. The chart shows the preliminary results from levelised heat costs calculated for 29 collector fields of sizes between 500 and 55,000 m2 integrated into district or micro grids. “The costs in the figure represent turnkey solar thermal system costs. They include tank prices, but exclude VAT and subsidies,” explains Franz Mauthner from AEE INTEC, Head of Subtask C: Technology and Demonstrators. “The heat price is calculated over a period of 25 years, with a loan interest rate of 3 %, as well as operation and maintenance costs at 1 % of the investment annually.” The chart includes 12 Danish district heating projects from the online database www.solvarmedata.dk in addition to 10 German demonstration systems with seasonal storage and seven different large Austrian collector fields. It should come as no surprise that Denmark with its large and standardised systems has the lowest costs per installed m2 of collector area. 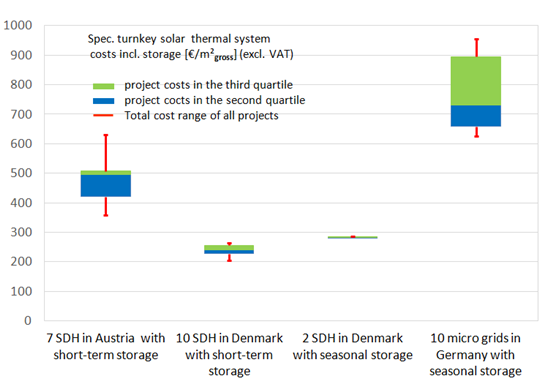 Specific costs for Danish systems including short-term storages range from 204 to 263 EUR/m2 (see table below). Germany is a high-price region in this regard, with costs between 626 and 956 EUR/m2. "Of course, these numbers cannot be compared, because Germany has many pilot projects and systems with seasonal heat storage,” explains Sebastian Herkel, Operating Agent from the Fraunhofer Institute for Solar Energy Systems in Freiburg, Germany. In Austria, moderate costs range between 359 and 630 EUR/m2, but can differ greatly. "It is a sign for a young market,” says Herkel. The following table is the base for a cost curve depending on the pant size. Later, the scientists will develop a model that also incorporates temperature levels in the district network and the type of storage. Levelised heat costs will be calculated as well. “During our last project meeting in April, we discussed where heat production will be measured,” Herkel says. So far, data has been difficult to compare, as some measure heat output directly at the collector field, whereas others count what is delivered to the customer. Generally, conditions for district heating are quite special in Denmark, for example, because of very cheap land. Heating grid costs are also favourable in Denmark, which has led to a high amount of grid-connected buildings even in rural areas and what has made it difficult to adapt the Danish model for other countries. If replicated, it would be feasible for small villages, more so than for urban areas, conclude the TASK participants. “The dependent factors are cheap land and standardised technology to mount the system and install the collector,” explains Herkel. Germany’s heating grids also have higher temperatures and must comply with higher standards for pipes and insulation. Within the task, scientists do not only examine solar system costs, but also analyse complex energy systems, including electricity. It is an important factor in increasing interaction between the heat and electricity sector to transform entire energy systems. The scientists have gathered data on the investments made in existing systems and programmed a software tool which searches for the most efficient and economical way to meet set conditions, such as a safe energy supply, availability of biomass, of fossil energies or of allowed CO2 emissions. The software application simulates the systems in yearly periods and includes investments, financing, operation and maintenance and the usual periods for consuming heat and electricity, for electricity prices and for solar generation. With those data in store, the program can create an ideal system solution by taking various energy sources and the share of district and individual heating into consideration. Of course, the task did not have to start from scratch, but could build on simulation tools previously used for other models (see www.ise.fraunhofer.de/de/veroeffentlichungen/veroeffentlichungen-pdf-dateien/studien-und-konzeptpapiere/studie-100-erneuerbare-energien-in-deutschland.pdf). The application also takes interdependencies between the heat and power market into account: With an increasing share of photovoltaics, electricity prices drop on sunny summer days. This makes co-generation plants less favourable in summer, but it benefits solar thermal energy. “We have been observing this trend in Denmark for several years and it has now reached Germany too,” concludes Henkel.